Bibek Sapkota is a passionate youth currently doing his Bachelors in IT. As a young Entrepreneur, he is also leading a social Enterprise called Urja Lab. He has been actively involved in the field of debate, interaction and innovations as a member of Debate Network Nepal and board member of Leo District Council 325 B1 Nepal. Besides all of this, he is also a member of Federal youth Parliament of Nepal and former Council Member of United States Embassy Youth Council. Bibek Sapkota during his talk at WCBRT2018. In WCBRT2018, he talked on a topic related to his work, i.e. WordPress for Entrepreneurs. We interviewed him in order to learn more about this inspirational persona. Here’s what he has to say. I am a passionate WordPress enthusiast, an entrepreneur chasing my dreams my way, and a compassionate social activist. I am from Pokhara and the WordPress community here is in its emerging phase. There are more than 100 energetic and focused youths looking forward to the advancements in this field and are ready to collaborate for personal and professional growth. We conduct regular meetups, WordCamp and other community activities to keep the community ever-expanding. I started my journey with WordPress during my school days because WordPress was the best platform for a novice blogger like me to learn and experiment about my interests. Since then, I have been engaged with WordPress and WordPress community for the last 7 years. My interest in CMS and the flexibility, easy interface, security and reliability WordPress provides in it has kept me going on this journey. During my initial phase, I have encountered some problems with design, security and maintenance issues but later I realized that those issues were challenges for me because I was not in touch with the WordPress community where discussions among fellow users happen. Attending meet-ups and WordCamps has helped me a lot to enhance my skills in the field. 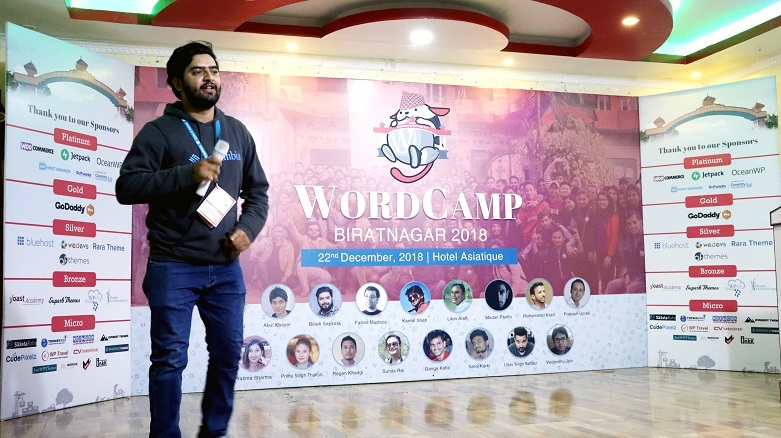 Yes, I was excited about my talk in WordCamp Biratnagar. I was pumped up for my first ever east journey. My talk was about “WordPress for Entrepreneurs”; a very relevant topic for me given my entrepreneur background. I talked about the maximum utilization of WordPress resources to promote and expand your business and services. I am grateful to the WordPress community for the opportunity to share my experiences in the platform. I hope the attendees gained some skills on optimum utilization of WordPress for promoting their business and service activities, the ways that would support their journey as an entrepreneur through good utilization of WordPress resources and some useful digital marketing tips. The WordPress community in Nepal has a lot of positive energy. We can see a lot of collaboration and cooperation in programs like meet-ups and WordCamps. This community has promoted employment generation in the Nepalese youth, encouraged communication between youth who share similar interests and also has provided a platform for the optimum use of WordPress resources. I think the next big step shall be an expansion of the WordPress community in different cities of Nepal which would give Nepalese youth who share an interest in this field the exposure they need. We could organize WordCamp Nepal, where young and energetic minds from all over the world could gather up and grow together, the number of contributors would also increase which would be very beneficial for the emerging WordPress community in Nepal. The thing that fascinates me the most is that I get to meet a diverse group of energetic and creative people who share the same interest as mine and there, I can find a lot of things to learn about. Every WordCamp I have attended has added my knowledge about WordPress, helped me in business expansion and the after parties are best in getting to know people better, basically, I have got a chance to socialize with young minds of my country which has added up to my networking skills. WordCamp Biratnagar had a lot of enthusiastic participants. It was the first of its kind in the east, and the teamwork was remarkable. Every person who was present in the program had an amazing spirit. I fondly remember having “bhakka”, a special dish from the east. It was different in the sense that it marked the expansion of the WordPress community, Nepal. First of all, I am an avid WordPress user which has helped in the promotion of WordPress on my part. I am a WordCamp and a WordPress meet-up speaker. Also, I have volunteered in a number of WordPress programs, also worked as an organizer in WordCamp Pokhara. I use themes and plugins from WordPress and have always worked with dedication in the contribution day. I would like to say that give your best, focus on learning, have patience, watch and read tutorials, experiment a lot with freely available themes and plugins. And most importantly, don’t miss WordPress meet-ups and WordCamps. I strongly recommend you to share and cooperate with fellow WordPress enthusiasts because it will only help you grow. We don’t see a satisfactory number of female participation in WordPress and it is a matter of concern for the whole community. Nevertheless, the females who are involved in the community are amazing at what they do and the community also respects them on who they are. Encouraging female participation in meet-ups and WordCamp could increase the number of female WordPress community members. My go-to source for WordPress would be Support Forums, WP Tavern, wp related news, tutorials point, GitHub and other tutorial sites. If I have a serious concern, I can always look up to someone in the WordPress community and they would always be eager to help. I love traveling, participating in debates or any other healthy interaction among people which would help me gather a lot of perspectives to look at things and giving back to society. I love that WordPress has a new editor for itself. After I have used it, I would tell that it is definitely worth a try, it helps in adding rich content. It makes both blogging and WordPress simple and using blocks is enjoyable. I would definitely recommend it to a friend. Bibek Sapkota at WordCamp Biratnagar 2018. Bibek Sapkota undoubtedly is an inspiring and influential person in the WordPress platform. We want to thank him for taking out time for this interview. Do you want to know more about Bibek Sapkota? Find him on Facebook or Twitter. ← Previous Previous post: WordPress 5.1 Beta 2 Available for Testing!